Based in the traditional port of Maldon for over twenty years, TS Rigging is situated at the heart of a traditional sailing area in the South East of England known as the Blackwater Estuary. Our offices and workshop at Downs Road Boatyard overlook an expanse of water which has been the gateway for vessels arriving in the district for well over 1000 years. 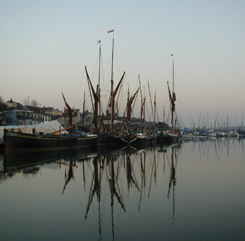 Today the Maldon is home port to the largest remaining fleet of fully rigged Thames sailing barges and a good colection of traditional East Coast Fishing Smacks as well as many Classic Yachts. Annual fishing smack and sailing barge races draw large numbers of these craft from the surrounding area and further afield, and the modern yachting scene is also very active, with both cruising and racing yachts enjoying the surrounding estuaries throughout the year. TS Rigging serves the complete rigging needs of modern and traditional craft. Call or visit us to discuss your requirements for standing rigging, running rigging, guardwires, blocks, mast hoops, deadeyes and the wide variety of other products and services, all supplied from our rigging shed here in Maldon. We are able to supply our products by post, both standard items and custom made. Additionally, we are able to deliver a full re-rig service anywhere in the United Kingdom or abroad through our competitively priced mail-order service. Contact us by telephone, fax or email for a quotation - in most instances if you send us your old rigging, we can provide like-for-like by return. For our office and workshop address see left. Company registered in England and Wales, number 0461 7420, 8TW.